We are in the process of completely renovating the second floor of our 5-year-old home. It's nothing fancy, fairly cookie cutter, but we did do some upgrades. The area I need help with is our bathroom mirrors/lighting. Do you have any a) good lighting/mirror suggestions and b) good stores to find possible solutions. Bathroom A will be a kids bathroom once we start a family. 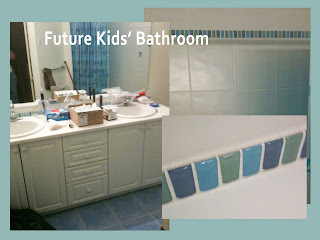 It has white cabinets, white counter tops, white tub...lots of white with blue ceramic floors (almost looks like a sky) and funky blue and green accent tiles. We're painting the walls blue. 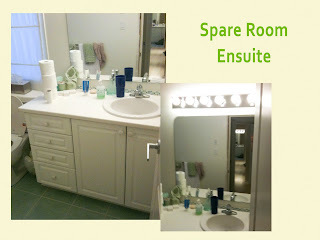 We have one long vanity with double sinks so i was thinking of two white framed mirrors. Right now we have the standard HUGE builder mirror with the "hollywood lights"
Bathroom B is the spare room ensuite. Very similar to Bathroom A, but in greens. The walls will be a light green. 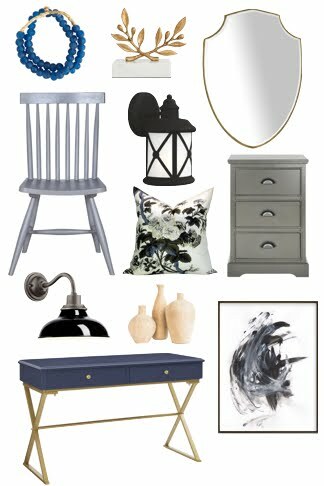 I was also thinking of a basic white framed mirror in here too - or possibly something in silver, but our fixtures are in brushed nickel. 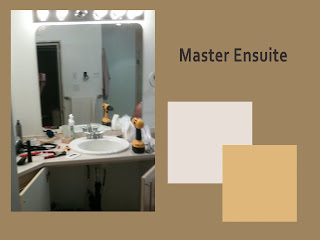 Finally, our master ensuite. This room has a bit more of an "earthy" feel and i'm going with a darker colour on the walls (SICO 6117-52 Rubens Autumn (walls) and 6117-21 Flemish Taupe (ceiling)) This is where i'm REALLY stumped. Our tiles are a light beige but i'd say more to a "peachy" tone as opposed to a "browny" tone. We were thinking of dark chocolate mirrors, but not sure this would go. To keep with the beachy look of the bathroom, white framed mirrors are definitely the way to go. But no need to get rid of the huge builder's mirror - simply frame over it! Check out how to do it on this great post over at Our Suburban Cottage. I would use the same size of 1x4 pieces of wood. This is a nice substantial width which will make your huge mirror seem less huge. Above the mirror, go for a simple contemporary light with a bit of a nautical feel like this one from Canadian Tire. The rounded shades work well with the round curves of the wall accent tiles, don't you think? Another option is to go with individual oval mirrors centred over each sink, like these pivoting ones from Home Depot. However, since kids love to look at themselves in the mirror, I personally would prefer the large single mirror. Now this bathroom is a bit more problematic because of what looks to be an off-center sink. Usually, you could put a mirror centred above the sink but in this case that would leave a gap over the bank of drawers. For that reason, I would stick with a single large mirror like you have now. You could do a white framed mirror or one in a brushed silver frame. It could be more decorative since this is the ensuite in your spare/guest room. A great source for decorative mirrors with interesting frames is HomeSense. Since this is the master bathroom, I'd go a bit more glamourous with it. 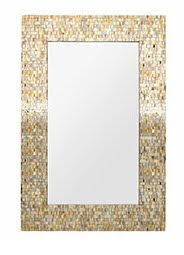 This mirror from Pier1 would look great and add a bit of sparkle. Overhead, you could go with a light in a brushed nickel finish (to match your fixtures), though you could also do something in more of a bronze finish like this light from Home Depot, which works with the earthy brown paint tones. You mentioned that you did like the "backlit mirror" look too though. 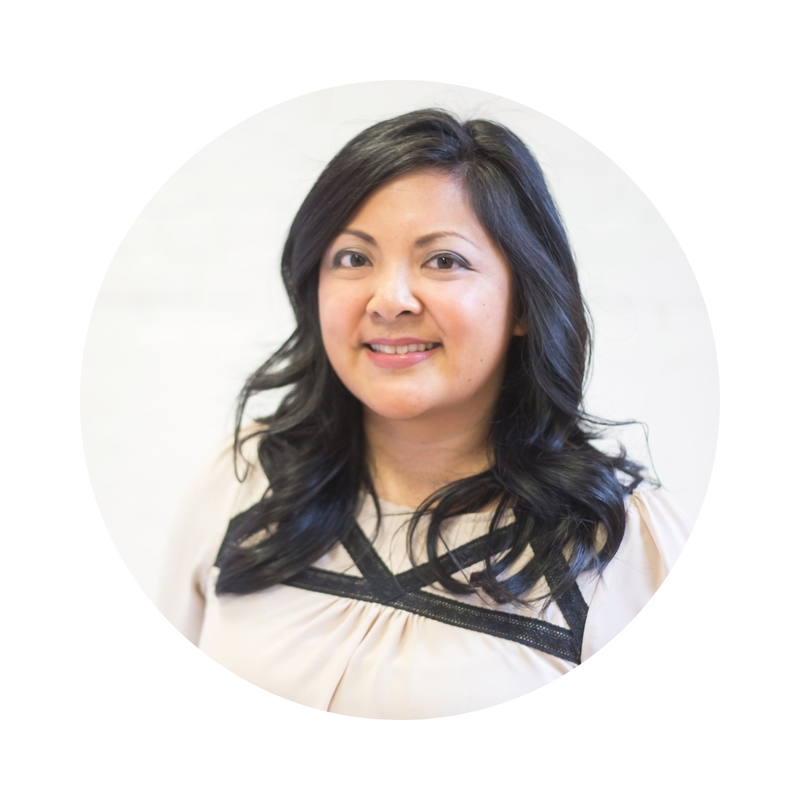 If you're handy, here's a great DIY tutorial from Cityline on how to build your own! Hope these suggestions help, Laurie! Low cost bathroom furniture online. nice blog, please share this link. So I went the Liquid Nails route when gluing on a frame to my huge 1970s bathroom mirror. This took forever and you can still kind of see the reflection of the glue behind the frame (weird). My sister in law did the same treatment to her mirrors but with velcro. Genius! Stick one side to the mirror, the other side to your frame, no glue necessary.